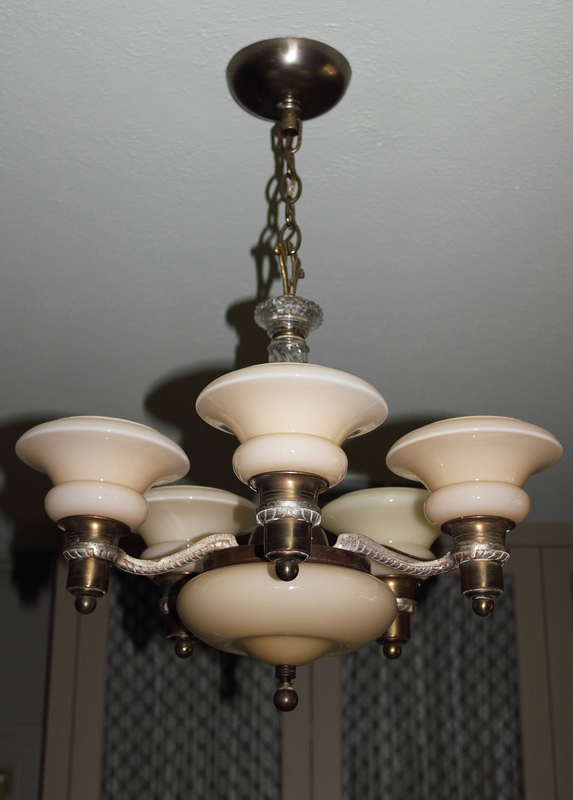 Above is the original dining room light fixture. And now, that the room serves a dual purpose as a library and dining room, this fixture can’t be more perfect. When I first moved into the house in 1985, this light fixture was a three-way. See the brass knob ball at the base of the light fixture? Turning it allowed me to alternate between having just the top five on, or just the bottom bowl on, or have all six illuminated (which was way too bright). But, all good things must come to an end, and the internal stem (or whatever it’s called) finally broke. Some day I plan on taking the whole thing down and locating someone who could fix it. In the meantime, a dimmer switch has been installed and works just as well as the three way if not better. But still… It would be cool to have it working in its original condition. Very pretty but if you add some chandelier crystals it might pop a little more.